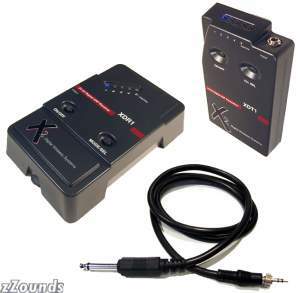 The X2 Digital XDS95 24-Bit Digital Wireless Instrument System is a new guitar wireless system from X2 Digital Wireless. The design team is the same group that designed Sennheiser's Digital 1000 system (which I currently use). The main benefit of these systems is that they do not use companders to squash the signal thus they often sound better than using a cord. I have only had a short time to play with the X2 but since I use the Sennheiser Digital 1000 at every gig I can tell you these are great systems. The really nice feature of the X2 is that it fits nicely on a pedal board so you non-rack folks can integrate the X2 Digital very nicely into your rig. The signal you get is phenominal. Almost better than a cable and definately equal to a cable without having to be tethered to your amp. I find my performance and stage presence is much better with without the cable. This could very well be my next big guitar purchase, highly recommended if your looking for a wireless solution.